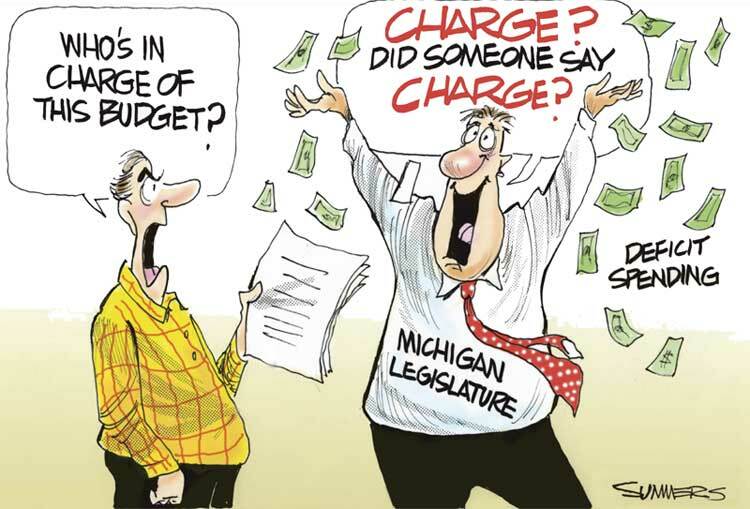 Discrepancies between what policymakers think they can spend and how much money is actually available have been a recurring pattern in Michigan government since fiscal year 2002. Michigan lawmakers were again confronted with this familiar story in May when the revenue estimating conference announced that the official Jan. 11 estimate of tax revenues for the upcoming fiscal year had been too optimistic. Forecasters said that there would be another gap between desired spending and projected income, also known as a "deficit." The House voted 61-48 to spend $32.2 million more than the latest estimate of available funding. Five Republicans voted in favor, along with 56 Democrats. Executive Budget Recommendation, the lower estimate will require a spending course correction. arguably the lawmaker least in need of a course correction. When the initial, larger revenue projection was announced in January, he tried to persuade the governor and Legislature to craft budgets that assumed only 96 percent of the money would be available. At the time, State Treasurer Robert Kleine dismissed this suggestion, saying that budgeting 4 percent beneath the estimate would require slicing $800 million from what the administration would like to spend. Had Pappageorge's advice been heeded, policymakers would likely have gotten through the May revision with a substantial and still intact surplus between anticipated tax receipts and desired spending. majority vote in both the House and Senate, but neither chamber had done so as of press time. The Michigan Chamber of Commerce has endorsed a similar concept. SJR E is awaiting action in the Senate Appropriations Committee chaired by Sen. Ron Jelinek, R-Three Oaks. The need for restraint was demonstrated on June 10 when the House of Representatives wrestled over funding levels for K-12 public school districts. Of the $393 million downward revenue revision, $186 million was the result of a decline in School Aid Fund tax receipts — the primary funding source for schools. Yet the House voted 61-48 to spend $32.2 million more than the latest estimate of available funding. Five Republicans voted in favor, along with 56 Democrats. "Are we nuts, or what?" asked Rep. Chuck Moss, R-Birmingham, who cast one of the dissenting votes. "How in heavens do we propose to pay for all this stuff?" Rep. Marsha Cheeks, D-Detroit, portrayed the overspending as a matter of virtue and resolve. "This overage says to me that we have made the commitment to find the money to fund schools in our coffers throughout the year," she said. Cheeks defined her fiscal priorities as the following: "I say fund education by any means necessary." The next morning, the House version of the school aid budget was rejected by the Senate, forcing both chambers to meet in a conference committee and attempt to compromise on a budget that — presumably — will also conform to the balanced budget requirements of the state constitution. The deadline is Oct. 1. Had it been enacted, the House version of Senate Bill 1107 would have spent more than $13.4 billion, exceeding the highest previous school aid budget by half a billion dollars. The governor's recommendation was $600 million above that benchmark, and the Senate proposed breaking the record by $400 million (but not overspending expected revenue). According to official state estimates, the public school population will decline by 25,000 pupils between 2008 and 2009. The largest-ever state public school population was recorded in 2003; the estimate for 2009 is 86,000 fewer students than that peak. To put these declines in perspective, the combined student counts in the second-largest through fifth-largest Michigan school districts was 88,606. And only the second largest district — Utica Community Schools — had more than 25,000 pupils. 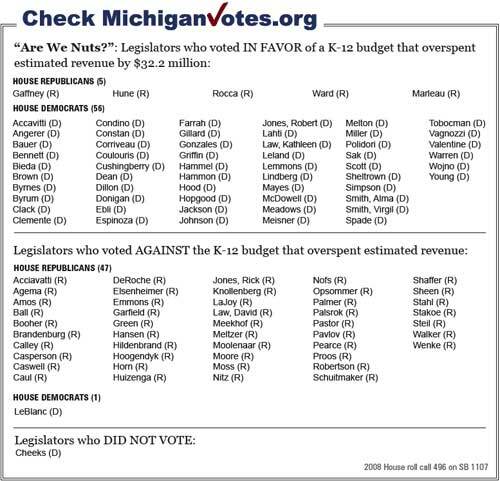 The MichiganVotes.org vote tally for the House version of Senate Bill 1107 is below. The contact information for members of the House of Representatives may be found at www.mackinac.org/9313.